Sarah LaFave (center) started the Lori's Hands student organization and helped develop the service learning course curriculum. 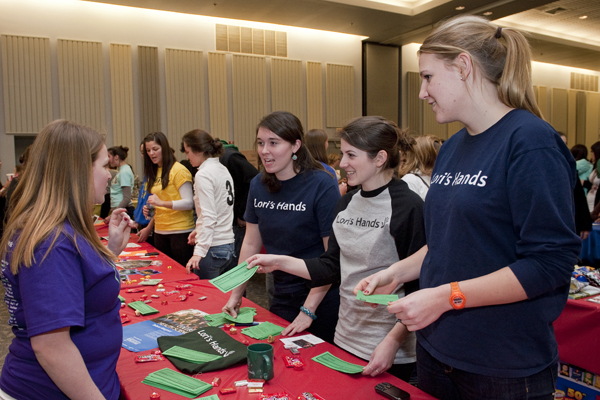 12:08 p.m., Oct. 24, 2012--When nursing student Sarah LaFave started a new registered student organization called Lori’s Hands on the University of Delaware campus in 2009, she had no idea that it would reach into the classroom as well as out to the community. Lessons learned from Lori’s Hands student volunteers and their clients have been incorporated into a new transdisciplinary course open to students throughout the University, HLTH 267: Chronic Illness in America: From Policy to Person, that builds on UD’s well-developed Service Learning Program. Diefenbeck says that students from a wide range of majors  not just those interested in health care careers  can benefit from the hands-on experience this course will provide. Students will spend two hours a week in the classroom and participate in weekly client visits via the Lori’s Hands volunteer organization. They will apply what they learn in the classroom to their interactions with clients, and in turn client feedback will be integrated back into what is taught in the course. “Lori’s Hands started as a feel-good way to fill an unmet need in our community,” says LaFave, who graduated in 2011 and now serves as care manager and volunteer coordinator at the Brandywine Village Network. The course provides a 360-degree perspective on the situations of aging and chronically ill individuals in America. It uses experiential service learning to allow for an in-depth understanding of the patient experience. The course readings integrate information that ranges across United States health care history, to chronic illnesses like COPD and MS, to the role of caregivers, to resource navigation, to health care systems across the globe. Class: 114 McDowell Hall, Tuesdays, 3:30–5:30 p.m. Required text and materials: Readings and other supplemental lecture materials as assigned (available on Sakai). Transportation to and from client visits.